The semiconductor industry may be seeing a new number one supplier in 2Q17, after nearly a quarter of a century, this is all down to if memory market prices continuing to hold or increase throughout 2Q17 and with the balance of this year, Samsung could charge into the top spot and displace Intel, which has held the number one ranking since 1993. 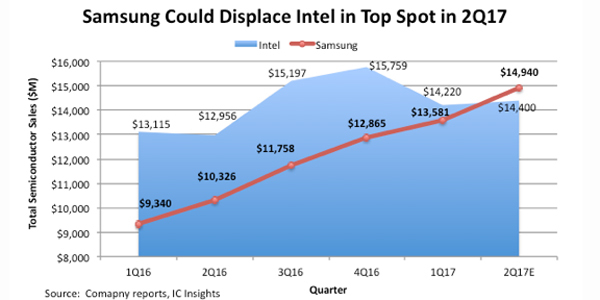 Using the mid-range sales guidance set by Intel for 2Q17, and a typical, 2Q sales increase of 7.5% for Samsung, the South Korean supplier would unseat Intel as the world’s leading semiconductor supplier in 2Q17, shown in Figure 1. If achieved, this would mark a milestone achievement not only for Samsung, specifically, but for all other competing semiconductor producers who have tried for years to supplant Intel as the world’s largest supplier. In 1Q16, Intel’s sales were 40% greater than Samsung’s, but in just over a year’s time, that lead may be erased and Intel may find itself trailing in quarterly sales. Samsung’s big increase in sales has been driven by an amazing rise in DRAM and NAND flash average selling prices, as shown in Figure 2. IC Insights expects that the tremendous gains in DRAM and NAND flash pricing experienced through 2016 and into the first quarter of 2017 will begin to cool in the second half of the year, but there remains solid upside potential to IC Insights’ current forecast of 39% growth for the 2017 DRAM market and 25% growth in the NAND flash market. Over the past 24 years, some companies have narrowed the sales gap between themselves and Intel, but never have they surpassed the MPU giant. If memory prices don’t tank in the second half of this year, it’s quite possible that Samsung could displace Intel in full-year semiconductor sales results as well. Presently, both companies are headed for about $60.0bn in 2017 semiconductor sales. 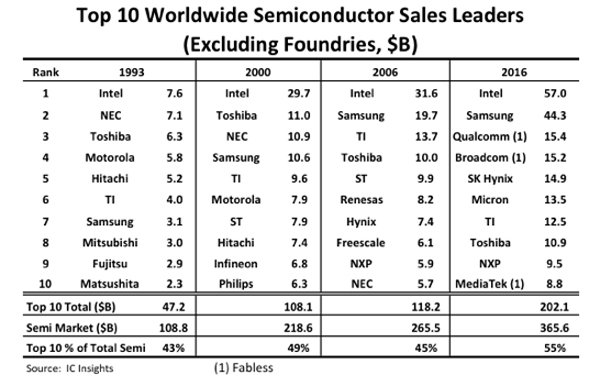 Top 20 Semiconductor Suppliers’ Sales Growth Rates Forecast to Range from Great (+31%) to Terrible (-17%) in 2012.